I have tremendous respect for Dumaguete’s trike drivers… these men work very hard, 12-15+ hours per day, driving all over the city. 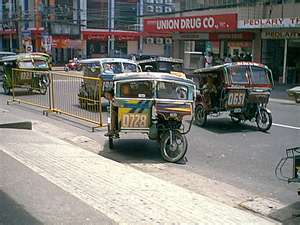 I can go out as early as 5:00am and find a trike on the street and a driver happy to take me wherever I need to go. The fare from my house to the heart of the city costs P8 (about $0.20), and the driver will take me door to door. If I’m going to the ATM and ask the driver to wait and bring me back home, I have never had a driver said “no.” They are happy to take a break while I wait in line, knowing they have earned a higher fare. Being a chatty person, I always strike up a conversation with my driver as soon as I get in the trike. It never ceases to amaze me how well we can communicate — English is so widely spoken here, and I throw in what little Visayan (the local dialect) I have learned, which makes the drivers smile. “Oh, you speak Visayan?” I respond with “gamay” (which means “little”), and they love it! From there the standard “where are you from,” and “how long have you been here” questions come, along with “are you married,” “where is your husband,” and “do you have children?” I recall reading — before we moved here — that Filipinos love to talk and learn about people, and this is absolutely true. “How old are you,” a question that most would find offensive in the United States, seems to be commonplace here, and I never mind answering. Often I ask my driver if he will make a few stops for me, and the answer is always sure! We might stop at the ATM, the pet store and then a sari-sari before returning to my house. Or it’s evening, and I take a trike to pick up (incredibly delicious) chicken for dinner at Jo’s Chicken. I always bag up an extra piece of chicken and a drink for my driver. If we stop at the sari-sari, I will grab an extra bottle of cold water for him. Small tokens like this go a long way here, and the drivers are always so appreciative (and quite honestly surprised). Sadly, many foreigners here have earned a reputation for being cheap when it comes to service, which absolutely appalls me. We have been welcomed into this beautiful country with open arms, yet I have heard foreigners complain that a trike driver “ripped me off for P10.” (Really? Your driver, who works 12-15 hours per day to support his family, is ripping you off for a whole P10? Have you taken a taxi in New York lately?) I will proudly admit that my husband and I consistently over-tip trike drivers, servers at restaurants and anyone we have hired to do yardwork or a job inside the house. We’ll buy them drinks and food – because we appreciate them, their hard work, their genuine smiles and the long hours they keep. As a result, we have numerous drivers’ names and numbers stored in our cellphones. If we send a text, asking if the driver is available (even as early as 4:30am the next morning) to take us to the pier to meet a ferry to Cebu, you know what? They say yes. I think they enjoy our company as much as we enjoy theirs — sure, they know they will be paid well, but my husband and I also know we will have wonderful, friendly service, so it’s a win-win for everyone. You can see where our hometown of Dumaguete is located at the bottom of the island. Effects of the earthquake were felt on the nearby islands of Cebu and Mindanao. While we did experience two very small “aftershocks” shortly after 5:00am, all is now quiet again. If you have never experienced a minor earthquake, it’s an incredibly odd sensation… kind of exciting, actually — provided there are no injuries, of course. I am relieved to add that there were no reports of injury or damage of any kind on the island of Negros.